Fantabulous Fall! Here's your SpinSheet racing roundup for the weekend of September 9-10. Sunshine, 14-16 knots of breeze from the north, cool early fall temps, and 120 boats headed from Annapolis to the Tred Avon Yacht Club. Does it get any better than this? Competitors in the Naval Academy Sailing Squadron (NASS) Oxford Race lucked into the kind of racing day we dream about all year long. Find complete NASS Oxford Race 2017 results here. 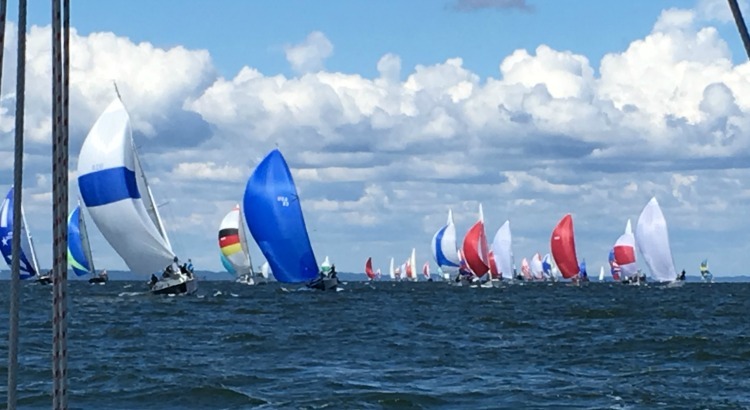 Eastport Yacht Club hosted 14 competing boats for the J/22 East Coast Championships over the weekend. Severn Sailing Association hosted its Crab Claw Laser regatta yesterday with 24 registrants. Find more SSA race results here. GANAR! and ALI-RU both won their racing fleet in the 2017 TRI-SERVICES REGATTA on Saturday. Of the 40 boats racing, 15 sailed in either the spinnaker or non-spinnaker racing division. Leading each of the 3 cruising fleets were CAT’S PAWS, BARBARA JEAN, and IRIS. Breezes were in the high teens with gusts above 20 knots on the course laid out in Hampton Roads Harbor. In the “team” scoring for the Tri-Service Cup, Army (Old Point Comfort Yacht Club) won the cup back from the Navy represented by Norfolk Navy Sailing Association. Langley Yacht Club (Air Force) was third. Racing Spinnaker (7 boats): 1.David Bouchard, Ganar! ; 2, Sidney Beard/Guy Sorensen, Blue Ghost; 3.Andrew Norris, Papahu. Racing Non-Spinnaker (8 boats): 1.John Lones, Ali-Ru; 2.Dave Nichol, Aeolia; 3.Jeff Rogers, Halaha. Cruising (8 boats):1. Michael Turner, Cat’s Paws; 2.Chess Harris, Belle of Virginia; 3.Jim Beaudry, Black Dog. Cruising 2 (9 boats): 1.Frank Hunt, Barbara Jean; 2.Randy Goodman, Red Frog; 3.Dennis Miner, Joy. Cruising 3 (8 boats): 1.Claude Speed, Iris; 2.James Gordon, Allegory; 3.Jason Bolvin, Happy. HYC ANNUAL MIDDLEGROUND LIGHT RACE. This race is an annual affair that used to share the weekend after Labor Day with the City of Hampton Bay Days Festival. This year Bay Days was rejuvenated, but located at the Langley Motor Speedway, not on the waterfront. Yesterday, racers being racers, twenty-one (21) boats raced around Middle Ground Light anyway. The PHRF A and B fleets’ and VIPER 640s’ course was 14.8 nautical miles and the PHRF C and Non-Spins all went 10.5 nm. As is traditional, crabs and libations awaited the racers at the post-race gathering. HYC Vice Commodore Dave McConaughy provided his Albin 31, Low Country, for signal boat. PHRF A (5 boats): 1.Neil Ford and Lis Biondi Ford, Danger Paws; 2.Phil Briggs, Feather; 3.Greg Cutter, Diablo. PHRF B (4 boats): 1.Rusty Burshell. Cool Change; 2.Ben Weeks and Michele Cochran, Rumble; 3.Andy Armstrong, Bluejacket. PHRF C (4 boats): 1.Alan Bomar, Roundabout; 2.Ben Cuker, Callinectes; 3.John Edwards, Recovery. PHRF Non-Spin (3 boats): 1.Ken Copeland, Black Widow; 2.John Lones, Ali-Ru. VIPER 640 (5 boats): 1.Mark Wheeler, Vapor Trails; 2.Peter Ill, Caterpillar; 3.Tyler Moore, Big Rooster. Principal Race Officer – John McCarthy; Signal Boat – Dave McConaughy, Low Country; Official Scorer – John Ritter. 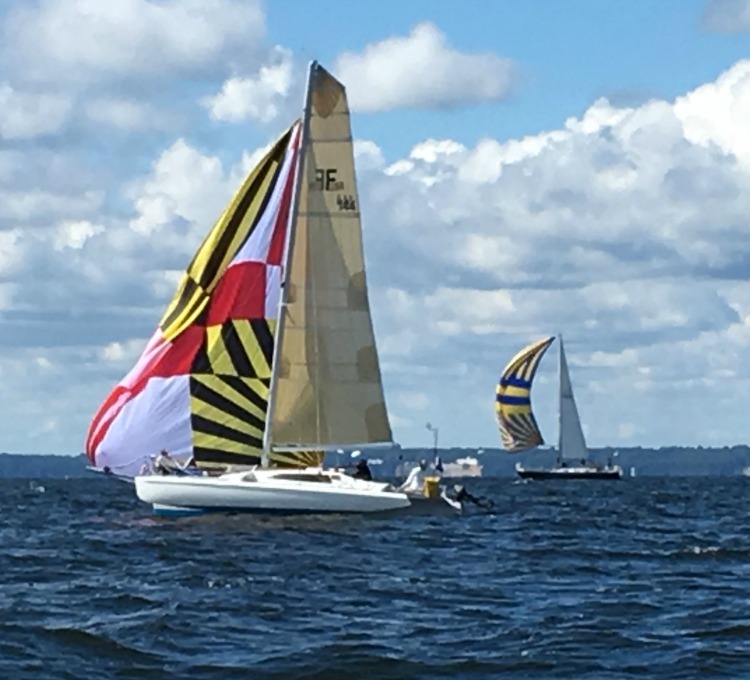 On Saturday, sixteen (16) boats with racers struck out in the FBYC WOLF TRAP RACE (named for Wolf Trap Light) and 14 crossed the finish line. PHRF A (4 boats): 1.Glenn Doncaster, Nanuq; 2.Craig Wright, Afterthought; 3.David Clark, Corryvreckan. PHRF B (4 boats): 1.Miles Booth, Shenanigan; 2.Bob Fleck, Mad Hatter; 3.Marston Roberts/Jim Raper, Rhapsody. PHRF C (6 boats): 1.Brad Miller, Schiehallion; 2.R. Collins, Morningtide; 3.Paul /Julie Ann Wash, Cheeky Monkey. PHRF Non-Spin (2 boats): 1.Doug Anderson, Red Sky. Principal Race Officer – Brooks Zerkel. HOW DO I GET MY CLUB’S RACE RESULTS IN THE RACING ROUNDUP? Easy! Just send us a note, a link to results, and preferably a photo or two to [email protected] by 9 a.m. on any given Monday. 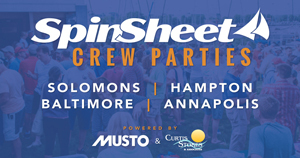 We’re happy to include any Chesapeake races or Bay sailors succeeding in far-flung regattas anytime!